In 1389, the Turks wanted to magnificently celebrate the first hundred years of their Ottoman Empire, which had a Sultanate at the time. Their plan was to go to war, to conquer the Serbian Empire and defeat its Army in Kosovo, and to mark the anniversary in a glorious way. The Turks started from Anatolia and headed to the Balkan peninsula via Kosovo, Belgrade, then over Drina, upstream Sava river, then to the South towards the Adriatic sea and then, go back home via Zeta and Raška. They wanted to make their sultanate an intercontinental empire. The battle against the Serbs on Kosovo field was supposed to be the highlight of their celebration. The Turks arrived in Kosovo on June 27th, the day before the big and important day for the Serbs – Vidovdan. For the Serbs, the Slavic god Vid was the connection with the ancient nation roots, the ancient nation's land. After becoming Orthodox Christians, the Serbs incorporated the ancient Slavic tradition in Orthodox Christianity and it continued to be one of the pillars of the Serbian nation and state. The Turks' intention was to break the cult of God Vid and the celebration of the heritage of the old ancestral religion (God Vid is considered to be connected to the creation of Serbian nation – he is the Slavic God of light, flash pot, bravery or warfare). Apart from breaking the cult of tradition, the Turks' aim was to break both Orthodoxy and Serbian knighthood as well. The battle on the big Serbian day would make a Serbian defeat bigger and Ottoman's victory more glorious. Serbs were preparing for the battle. The previous battles with Turks were in Niš, Pločnik,… they were just preparation for the big ones. Three years ahead of the Kosovo battle the Serbs had bought six cannons from Venice (in today's terms, it would be like if the Serbs had S-300 in 1999). So, it says that Serbian Tzar Lazar was preparing for the battle. The battle happened, both leaders, Serbian and Turkish, were killed. After the Kosovo battle, the Turks gave up their plan to go further than Kosovo. They gave up their plan for a glorious celebration of the first hundred years of the Ottoman Empire. Europe declared the victory of the Serbian army. The Turks left Kosovo. The Serbs stayed there for the next three months. After that time, Ugars (Hungarians) attacked Serbia from the North. When they came near river Morava, Lazar's wife Milica asks Murat's son Bayazit to protect Serbia from the Ugars' attack and in return she offered Serbian vassalship to the Ottoman Empire of Šumadija and Northern parts that were under her control. But, Vuk Branković and King Tvrtko did not accept the vassalship. Also, it cannot be true that all the Serbian army and all the nobility died in the Kosovo battle – if it was true, it would not had been possible that Serbia had 5,000 armored chevaliers, three years after Kosovo battle, under the command of Stefan Lazarević, who were deployed later in the battles on the side of the Ottoman Empire and helped it a lot to become skilled in war. The Ottoman Empire was at war with Western countries of that time. The interpretation of the Kosovo battle as a Serbian defeat starts to appear after the fall of Serbia under Despot Stefan Lazarević and then after in the 16th century. Was the story of defeat one of the narratives created during the Turkish rule over Serbs? How Serbian people were keeping and preserving their culture and tradition for five hundred years under the Turkish rule? 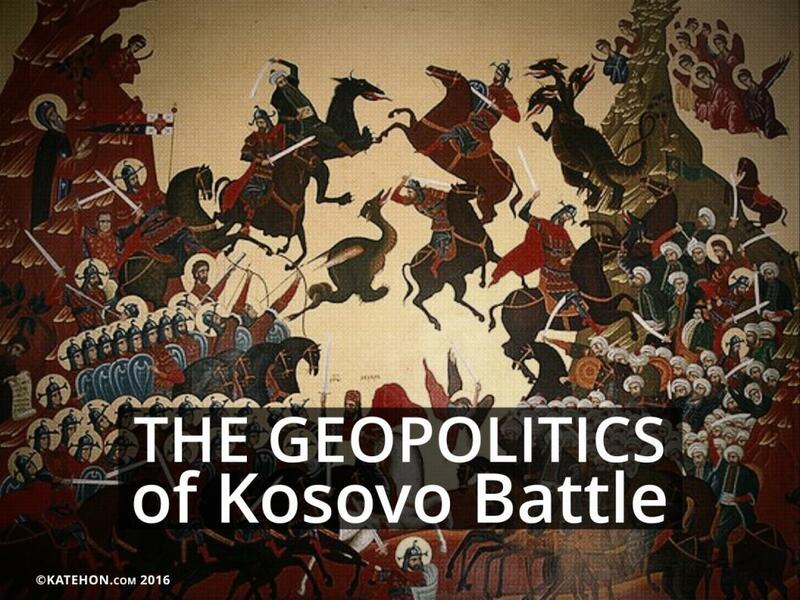 The Kosovo battle shaped the nation throughout the centuries. The ruthless Otoman Empire was heading to Europe and the Serbs were to be jumped over. Although historical data and various historical sources are entirely confronted - who won, who did what, who was the moral and who was the real winner of the battle - the bottom line is: Kosovo is Serbian Holy Land and nothing can change it. Before the Turks, under the Turks, after the Turks, in the reborn Serbian Monarchy, in Yugoslavia and now, again, when Serbia is occupied by the United States, Great Britain, EU, and NATO. When the only way to separate Kosovo from Serbia was via an illegal war with the most powerful war machinery in the world, it was shown again that Kosovo and Metohija is Serbian Holy land and that even NATO and its robust military complex could not defeat the Serbian army in Kosovo. It, maybe, defeated it, somehow, in Bosnia and Croatia (let's say), but not in Kosovo. Kosovo is Serbian Holy Land not just because of the presence of the Serbian Orthodox Church and its Headquarters in the Patriarchate of Peć, or because Serbs sacrificed the best of them at that time in order to preserve the state, ancestors' tradition, religion, and, therefore, the life of national being. And, not just because of the fact that the Serbian nation and Serbian Orthodox church are inseparable, back then and now – they keep each other in Kosovo. And, those five hundred years under the Turks showed again that Serbia, Serbs, and Kosovo are inseparable. From The Great Tzar Dušan to the heros of the battle of Košare and to all those living there now, Serbs have been showing that Kosovo is in the deep roots of Serbian national, religious, and social being. Either in epic, historic or any other form. Even Bondsteel did not work. Now Atlantists' have a new strategy for defeating Serbia in Kosovo - it is to sneak into the educational system of Serbia and to present history in some entirely new way – and to use education, as they do in the US, as a geopolitical tool. The new generations of Serbian primary pupils will have to learn that Albanians were always living in Kosovo and then the Serbs came. Maybe the new appointed Chief of Parliamentary Board for Education, Moamer Zukorlić, will have to direct his intention to this disgraceful Atlantists’ trend, and will have better control of what is in the programme of state schools. Identity politics has come to gobble up an increasingly significant proportion of mainstream political discourse.